Thousands of Sacramento State students struggle with food insecurity, and many are homeless. Add to that a sudden, unexpected expense, and they may drop out of school and never return. Sac State, where nearly half of the students are eligible to receive federal financial aid for their education, is leading the way in the California State University (CSU) system with a massive safety net to help them. “What we have here is the full complement,” says Beth Lesen, assistant vice president for Student Affairs and Dean of Students. “One campus may be really good with emergency housing. Another may be good with an emergency fund, and another is good with a food pantry. The students have an advocate in the University’s case manager, Danielle Muñoz, who works to remove obstacles to their education. Last year, she assisted 275 students. This year, she saw 50 in just the first two weeks of September. Some students seek her out directly, but most are referred by faculty, staff, or the Behavioral Intervention Team. To support many of the Sacramento State programs outlined in this article, please click below. On behalf of Student Affairs, Muñoz and Lesen accepted a Congressional recognition certificate from Assemblyman Kevin McCarty during the 2017 Hunger & Homelessness Community Awards. Associated Students, Inc. (ASI), Food Pantry and Pop-up Pantries – Sac State’s student government leadership opened the campus food closet in September 2015. Students may visit once a week and, with their valid Sac State OneCard, spend points on toiletries and nonperishable food items. The pantry depends on donations from the campus community and local businesses. In partnership with the Central Downtown Food Basket, ASI operates pop-up pantries where students can shop for free fresh fruit and vegetables. Students are turning to the ASI Food Pantry and Pop-Up Pantry in record numbers. During the 2016-17 academic year, the pantry in Yosemite Hall distributed 32,868 food and toiletry items to more than 1,000 students, with approximately 127 student visits each week. Each Pop-Up Pantry event drew around 350 students. The numbers were up in September 2017, with an average of 207 weekly visits to the pantry. The three September Pop-Up Pantry events served a total of 1,800 students. Host a Hornet – Student Affairs and the Sacramento State Alumni Association collaborated on this new and growing project. Interested alumni are matched with a food-insecure student, who they invite into their home for dinner twice a month. Neighborhood churches – Members of the Newman Center, Fremont Presbyterian, and Sacramento Central Seventh-Day Adventist Church, all close to campus, have opened their homes to Sac State students who are homeless or hungry. 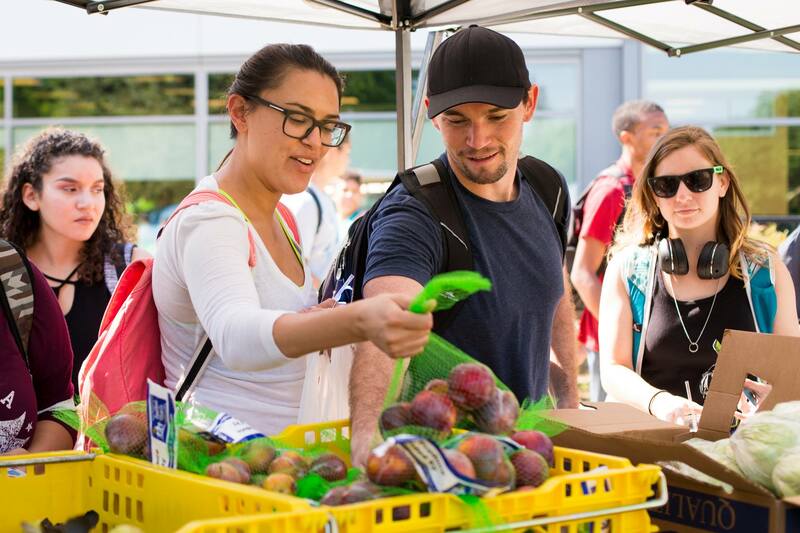 CalFresh – Sacramento State received $15,000 from SNAP, the federal Supplemental Nutrition Assistance Program, to enroll eligible students in CalFresh, the nutrition assistance program that helps them stretch their food budget. So far, more than 100 students have applied. Catered Pantry – This service will launch in spring 2018, when students can sign up on the Sacramento State app to receive push notifications whenever leftover food is available after catered functions at the University Union, The WELL, and Alumni Center. Students will have 20 minutes to arrive at the location and must dine there. The pilot project is modeled after Fresno State’s Catered Cupboard and is sponsored by IRT, UEI, the University Union, and Campus Dining. "ASI also is working on the Catered Pantry, as we hope to have some leftovers available when we move our offices back into the University Union and have refrigeration," says Reuben Greenwald, ASI's director of student engagement and outreach. Sacramento is one of the country’s priciest rental markets, making it difficult for students to find affordable housing. If they’re evicted for not paying their rent, they may become homeless and forced to sleep on a friend’s couch, in their car or a tent, on church steps, or at a shelter. Student Emergency Housing Program – As many as four students at a time can live in a campus residence hall for up to 30 days. The monthlong “breathing room” gives students and the crisis manager time to arrange for long-term housing. Students also get a meal plan for the Dining Commons if they don’t have federal Supplementary Security Income (SSI) or CalFresh benefits. “We tailor every single thing for every single individual person,” Lesen says. Herky’s Roommate Finder – The University’s mascot is the namesake of this online service for students who can’t afford to live alone. “It’s an idea initiated last year by ASI and developed by ASI and IRT in collaboration with Student Affairs,” says Greenwald. Sac State’s Student Advancement Council and Student Alumni Association raise money for the emergency fund. Seth Robert Nelsen Emergency Fund – President Robert S. Nelsen and his wife, Jody, endowed this fund in the memory of their late son. Student Affairs will host its next clothing drive in Spring 2018. Last year, the effort brought in approximately 800 pieces of “career clothing” that were distributed to more than 300 students, to help them dress professionally for job interviews and internships. Lesen proposes a plan to help students manage their financial aid disbursements. University Communications shares news and information about the University. You can subscribe to our news releases and to the Sacramento State Leader, our weekly e-newsletter. And we invite you to be our partners in telling the Sac State story. University Communications depends on students, faculty, and staff to alert us about campus events, projects, studies, and accomplishments.